The Health and Sport Committee has concerns that the NHS is missing out on 'vital' money. 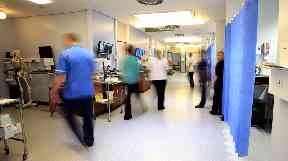 NHS: Is missing out on 'vital' sums of money. The Scottish Parliament's Health and Sport Committee has raised concerns that NHS boards are missing out on "vital sums of money" because they cannot identify those entitled to NHS care. Only those people who are not "ordinarily resident" in the UK are charged for using NHS services, however it is currently not necessary for a GP to establish a person's country of origin before treating them. The committee is calling on the Scottish Government to establish a standardised approach to identifying those not eligible for free NHS treatment, warning that boards are potentially losing out on "significant revenue". Lewis Macdonald MSP, convener of the Health and Sport Committee, said: "The Committee support the principle that anybody in Scotland can access GP services or A&E departments free of charge when needed. Mr Macdonald said: "We believe the Scottish Government should begin a review of the current situation immediately and have asked them to adopt a clearer and more unified approach to ensure access to NHS treatment is applied fairly and consistently. "Our research has also shown that the prices charged for NHS services to those not entitled to them vary considerably across the country without any justification for the differences in fees being provided. "This is another issue which NHS boards and the Scottish Government must work to make simpler, clearer and more transparent wherever possible." A Scottish Government spokeswoman said: "We welcome the committee's report into this complex area of law, which is made more complicated by the uncertainty about ongoing arrangements after Brexit. "The threat to reciprocal healthcare comes entirely from the UK Government's Brexit policy and would be resolved by staying in the EU, in line with the wishes of the people of Scotland. "We are committed to ensuring that life-saving care will be provided as a priority before checking residency. "We will study the committee's report and respond once we have clarity around new arrangements."